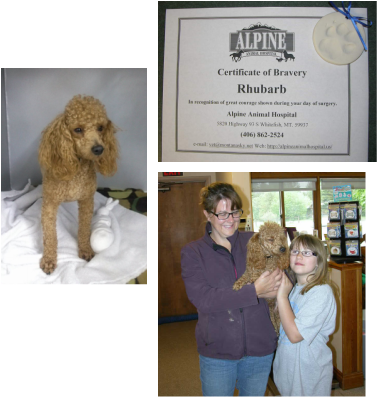 A day in the life of a surgery patient at Alpine Animal Hospital starring Rhubarb the poodle. Next up is a thorough physical before undergoing anesthesia. This is also the time frame in which any pre-anesthetic blood work can be performed. 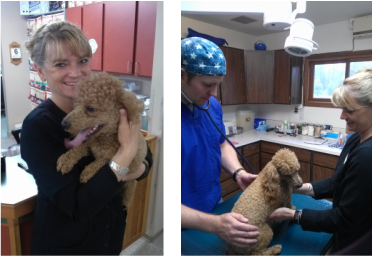 Pre-anesthetic blood work allows us to check major organ function in your animal to determine if they are healthy enough for surgery. If there are any abnormalities we will customize drug protocols in order to maximize the safety of anesthesia. Rhubarb is placed on machines that measure blood pressure, heart rate, EKG, temperature, and respiratory rate while under anesthesia. Patient safety is our main priority so we monitor our patients very closely. Next, Rhubarb is covered with a surgical drape, this is necessary in order to create a sterile enviornment that will lessen chances for post-operative complications. Once the patient is draped, Dr. Morrell (far right) performs the surgery. Rhubarb is ready to go by late afternoon and is reunited with his family. Also, he receives a certificate of bravery and an impression in clay of his paw to go home with him. He did a great job and was an excellent patient. Here is Rhubarb checking in and getting weighed on the scale first thing in the morning. Once anesthesia has been induced, Rhubarb's nails are trimmed and his surgical site shaved. Now that he is prepped, he is ready to go into the surgery room for his procedure. Once the surgery is complete Rhubarb enters the recovery phase. 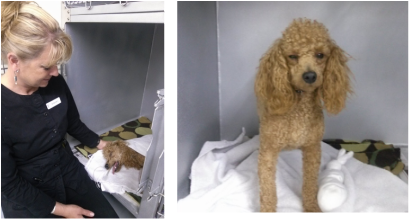 He is taken to his kennel and kept warm with warm pillows while he wakes up.